As the ICO industry started growing, it quickly became a popular crowdfunding method for new business platforms. Rising competition made it necessary for new ICOs to find ways of attracting new investors to fund their projects or jump-start their platforms. This gave rise to new bounty program variants and Airdrop campaigns that many ICOs implement nowadays. For those who don’t want to put their money in tokens or cryptocurrencies, but still want to participate in these ICOs, bounty programs and airdrops are a great alternative. However, while the advantages of bounty programs are clear for the both ICOs and bounty hunters, the role of the airdrops is not so clear. Therefore, it would be interesting to delve deeper into the airdrop figure and understand how it works in every case. Rally is dedicated to attributing fair value to content sharing, putting power back in the individuals hands and rewarding them. Arfreyr revolutionizes the supply chain for mCommerce. To understand how an airdrop works, it is important to establish what it is first. 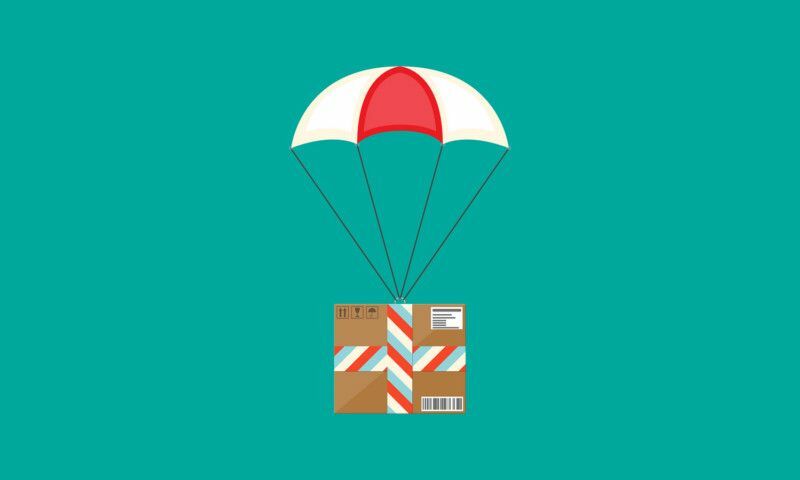 Airdrops are a reward mechanism in which tokens or coins are distributed to holders of other coins or tokens, or within the same community to holders of the same token, when certain conditions are met. Most people are familiar with forks and call the duplicate coin that comes out of these forks an airdrop, but that is technically not an airdrop. In the case of an ICO or token sale, an airdrop can serve to expand the user base of the project by leveraging an existing network of users. For instance, OmiseGo airdropped tokens to Ether holders to incentivize the use of their platform. Some ICO airdrops require no more than basic registration information such as the applicant’s name, email address, and wallet address; others are automatic and go through to holders of other coins without any kind of registration needed. Why have an ICO Airdrop? Not all ICOs have a sufficient marketing budget when they start out, in fact that could be one of the reasons why ICOs have gaps between their Pre-and Main Sales, namely that they will be using a significant chunk of the funds generated from the Pre-Sale towards marketing for the Main Sale. Therefore, a token Airdrop is a risk-free way of raising awareness and encouraging engagement with the community while at the same time gaining promotion in return. This of course, if the similar motivation behind allocating tokens towards bounty programs. It is a way of paying for marketing on a mass-scale, without actually using existing funds to pay for it. They can build the foundation beyond the early adopters. This is crucial as the greater the number of token-holders that a project has, the more likely it is to have an inherent loyalty to its success as they are personally invested in the project. Airdrops ensure that an ICO tokens are owned by a wider pool of crypto enthusiasts rather than just a small group, as this can decrease the number of whale investors who could dump large qualities of tokens and adversely affect the market value of the token. Thus, even though the tokens are ‘free’, an Airdrop could still contribute positively to the stability of a token. Exchange and platforms developed from completed ICOs host Airdrops randomly after the ICO, as a reward mechanism for their token holders. For example, this is fairly common among gambling cryptocurrency platforms, but is also adopted by more main-stream platforms, as was the case with Binance in 2017. Hard-forks on existing cryptocurrency blockchains are sometimes referred to as airdrops, although they are not necessarily airdrops. For instance, when the bitcoin blockchain hard-forked in November 2017, BTC holders received a free equal amount of Bitcoin Gold (BTG) on the forked chain. Just like bounty hunters go looking for ICO bounty rewards, ICO airdrops have the same effect. Due to the high volume of ICOs and their bounty programs and airdrops, it can be hard for people who are interested to keep track of all the projects. This is especially true with those Airdrops that are only announced right before they happen. For upcoming ICO airdrops, some great places to look are on sites that list them alongside their ICO list, as we do, as a well as the altcoins section on the BitcoinTalk’s altcoin board on their forum. Viewing their boards will require registration, though. Sign up for project newsletters. When browsing a list of ICOs – if you see one that is of particular interest then proceed to their website and request email notifications whenever they have an announcement. This is especially useful if they choose to have a flash Airdrop. Social media is also a useful tool for finding airdrops by searching for hashtags such as #airdrop on Twitter, as this will return a few options. There are also a variety of websites that are dedicated solely to airdrop announcements, such as airdropalert.com. Check our own ICO list where you can see all the initial coin offerings we have listed that offer airdrops. However, sometimes airdrops come to you, such as on the Ethereum platform. Users can occasionally find tokens of unknown origin in their wallets. While there are rumors that these were somehow accidentally transferred to the users account during transactions, they were actually distributed to users by a new ICO that is hoping to generate awareness and interest in their project by gifting tokens to users, according to a snap shot of a given blockchain and other criteria. The plan there is that users will see the token and investigate it, thereby hopefully leading to not only to actual investment by the receiver, but also from other who were exposed to this coin through the receiver’s inquiries on the various social media platforms. The drawback with this approach is that users sometimes just look for the exchanges that list those tokens to swap them for well-known cryptocurrencies without finding out more about the token. Why do many ICOs choose not to have Airdrops? However, as tempting as the idea of free anything is, it is always good to do your due diligence before participating in any Airdrop campaign, as there is a notoriously high incidence of hacking and malicious attacks on user wallets amongst Airdrops. Many ICOs shy away from launching an Airdrop precisely due to this issue; they don’t want potential investors avoiding their project due to negative prejudice others might have about airdrops. What are some possible solutions for ICO Airdrops to adopt to counter these perceptions? Some ICOs choose to launch their ICO Airdrops in partnership with established platforms, in order to assuage suspicions. Ontology recently adopted this approach with NEO. This of course benefitted both parties, as it generated excitement in the NEO blockchain community, while increasing awareness of Ontology and its ONT token. The trust established by NEO, would likewise be carried to the community members, as the Neo platform was essentially giving their stamp of approval to the new project by talking such a public stance with them. What are some warning signs to look out for before participating in an Airdrop? Never give your wallet key-code away to an Airdrop. That is a typical phishing attempt to get your details and siphon your wallet. Read the whitepaper and check team member backgrounds. Are these real people? Try looking them up on LinkedIn, Facebook and so on to see what comes up. You could even try to paste the image as a search on Google images too and review the results and click-throughs. Go to respected forums to see what the general opinion is. There will always be those who claim that an ICO is a scam, and others who recommend the platform with a simple ‘great project. I look forward to seeing where this goes.’ Look for more complex reasoning and then research the legitimacy of the project’s claims. Create a wallet and email address solely for airdrops. Transfer all of your cryptocurrencies to a hardware wallet such as Trezor once you get them. Even if the ICO or cryptocurrency is well-known, visit their social media sites through their website or link on their whitepaper to see whether they have posted anything about an Airdrop. There are many fake accounts created by scammers, so it’s best not to depend on a regular search. The original company may not even have a site on that particular platform to begin with, thereby making those platform users all the more susceptible to scam accounts. Now that you know the basic principles behind airdrops and how they work, you can go looking for some and pick your favorite ones to participate in. We will be updating our own list, so you can also choose some from there.